Dr. Henricks received his B.S. degree from Pennsylvania State University. He received his M.D. degree and took his residency training in Anatomic Pathology, and fellowship training in Chemical Pathology and Informatics at the University of Michigan Medical School, Ann Arbor. 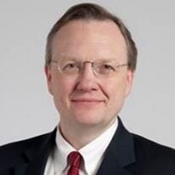 He is the medical director of the Center for Pathology Informatics at the Cleveland Clinic, where his team is responsible for administrative and technical aspects of pathology informatics and laboratory information systems. His interests include laboratory operations, management of pathology/laboratory data in the context of electronic medical records systems, the effective implementation of technology for laboratory information management, and laboratory accreditation. Dr. Henricks is a founding member and a Past-President of the Association for Pathology Informatics and is currently Vice-Chair of the Informatics Committee of the College of American Pathologists. His clinical service includes surgical pathology case sign out with subspecialty interest in gastrointestinal pathology, and sign out of protein electrophoresis and immunofixation in clinical pathology. Copyright © 1994 - 2019 Scientific Symposiums International, Inc.
Do you want to include a SAMs/MOCs Exam with this course? We hope you find the new website to have all the valuable content and information you need. Please let us know if you have any feedback! Enter your email to receive the latest news, updates and promotions for our upcoming courses!